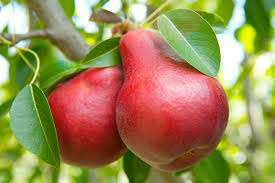 A new addition to our range selected to fulfill the popularity of beautiful red Pears! Auutmn Red is a little later ripening than Sensation, has a good extra-sweet flavour and is pollinated by Beth, Concorde, Invincible, Williams Bon Chretien and Glou Morceau. Would appear to make a small, compact tree.